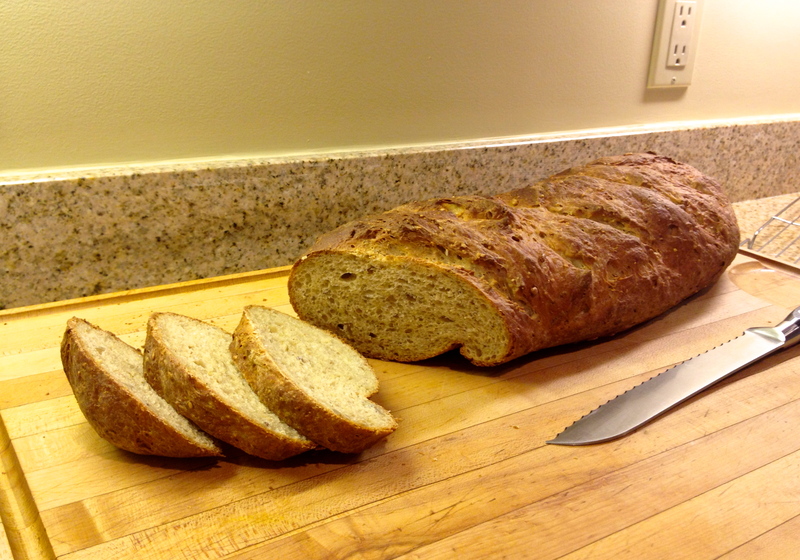 A healthy bread that has a soft, moist crumb and chewy crust. In a microwave-safe bowl, heat the cottage cheese gently until it's just lukewarm. Add all ingredients to a stand mixer bowl fitted with a paddle attachment. Mix thoroughly on low speed. Be patient, as most of the moisture comes from the cottage cheese so it seems to come together more slowly. Switch to a dough hook and knead dough until the cottage cheese is broken down and "disappears" into the bread dough. The dough should show a silky smooth texture, but somewhat stiff. Set aside in a large lightly oiled bowl, cover and let rise until puffy (a finger pressed in will leave an indent), about an hour. Gently punch down the dough. For one large loaf, leave the dough in one piece. For two medium loaves, divide dough in half. Gently flatten loaf (loaves) and shape into log, oval or ball..
Place on cornmeal dusted baking stone, or greased baking sheet. Cover with lightly greased plastic wrap. Let rise for about an hour or until dough is very puffy. Preheat oven to 425°F while dough is rising. Uncover dough and slash with 3 -4 diagonal slices using a very sharp knife. Spray loaf (loaves) with lukewarm water. Optional: During the first 5 minutes of baking, open the oven twice and spray additional water into the oven. Bake for 20-30 minutes until loaf has a nice golden brown color and is hollow sounding to the tap. Cover with tented aluminum foil if browning too quickly. Remove bread from the oven and after 5 minutes remove bread from pan. Cool on wire rack. Recipe created by Walter Lange, Grand Prize Winner of the 2016 Strolling of the Heifers' Great American Bread Recipe Contest. Sponsored by Red Star Yeast and King Arthur Flour.